The Martin 000-28VS Acoustic Guitar is one of those rare guitars that sits somewhere between a top-notch instrument and a piece of artwork, for its rich tone is nearly as inspiring as the detail work given to its craftsmanship. With a body and sides made of solid East Indian rosewood and a solid Sitka spruce top, the Martin 000-28VS has a tone that draws you into the music and a playability that only comes with the finest made guitars. This should not come as a surprise seeing as that Martin makes some of the best acoustic guitars available. The 12 frets clear of the body and sloped shoulder are reminiscent of the 30’s Dreadnought style. The incredible detail work of the Martin 28VS makes this piece lovely to look at. But unless you are fingerpicking and keeping your strumming to a moderate level, the 28VS can become a bit strident in the middle tones; overwhelming the more vibrant high and mellow low notes. If, however, you have the time to let this beauty age, it becomes more rounded over time and sounds more balanced the longer you play it. That said, you can address some of the stridency of the middle tones by choosing extra light strings or silk and steel. At <$3,500 (including a hardshell case), this is not a guitar to purchase if you don’t have the time and patience to do some fine-tuning and adjusting, but if you do, you will be happily surprised at what lies in store. 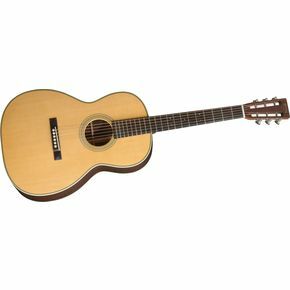 See more great guitar reviews at Martin Acoustic Guitars.